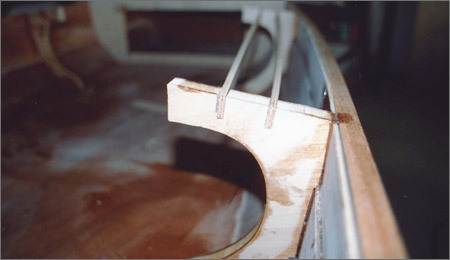 9 · This shows the location of the mock up center board and forward bulk head. 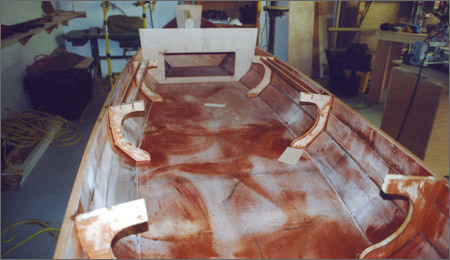 10 · Here both the forward and aft mock up cases are in place along with a forward water tight bulkhead for storage. The sheer is also temporarily set. 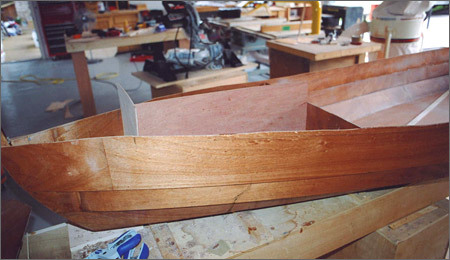 11 · A close up of the aft mock up and the location of aft most bulkhead. I have trimmed the sheer to the outwale at the point. and placed the knees that will support the combing. 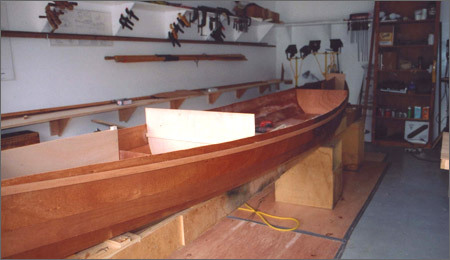 13 · All six knees are in place and the stiffing beams for the combing have the slots cut and the beams are dropped in. This will provide support because here the combing acts as a seat for hiking out. 14 · A close up of a knee and the combing support. I’ve laminated 3mm and balsa end grain to make the knees light weight and strong. Knees made from 9mm would also work and be less labor intensive. 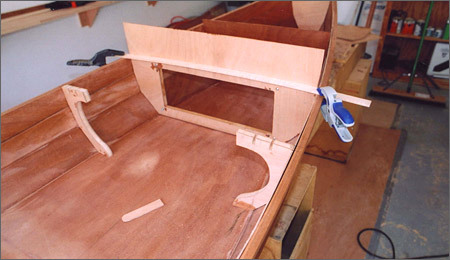 15 · Here all the bulkheads and both center board cases are in place. 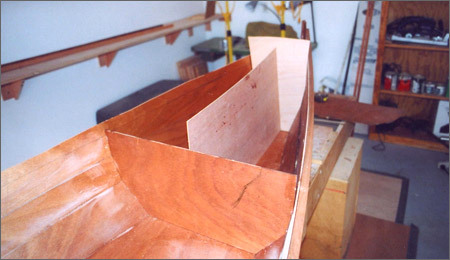 The bulkheads have been epoxied in place but the center board cases are not. 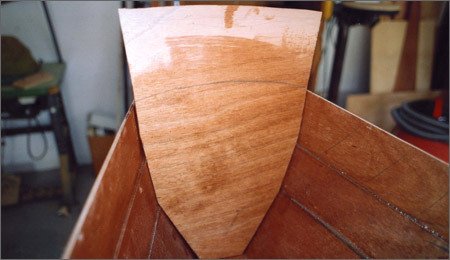 The camber on the bulkheads has not been cut. 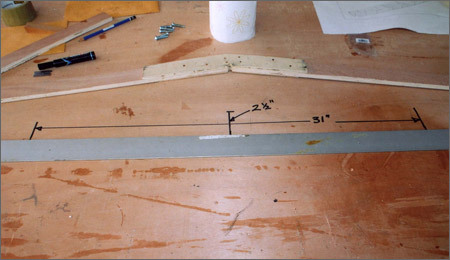 16 · This shows how to make the camber jig. 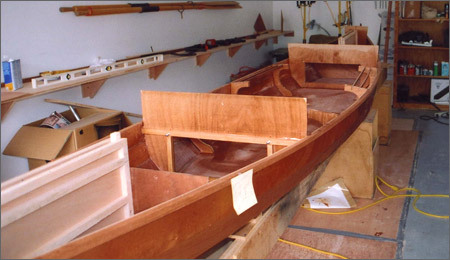 The maximum beam at the bulkheads is 31 inches and I want a 2½ inch camber to the decks. I’ve gone up 2½. 17 · I’ve joined two battens where they cross the maximum beam of 31 inches and the height of 2½ inches. I’ve drilled a small hole for a pencil where the two battens meet. 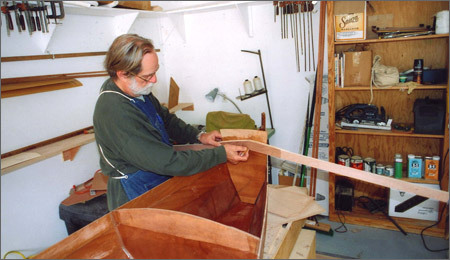 18 · Here I’m using the jig to scribe the camber on the aft most bulkhead. 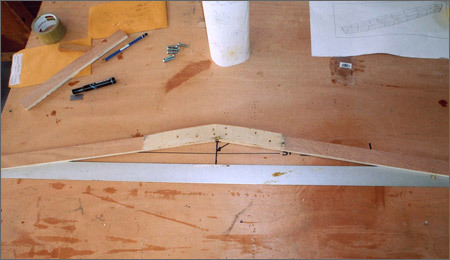 19 · The pencil line shows the arch and it’s ready to cut. The camera lens has distorted the line somewhat and it doesn’t look symmetrical. The next step will be to cut and trim to the line.